For years, photographers and industry pundits have predicted the demise of the Micro Four Thirds (MFT) camera system. Many believe that the smaller sensor has been superseded by APS-C cameras and the ever-growing lineup of full-frame mirrorless shooters. "Not suddenly, but slowly over the course of the next couple of years," photographer and author Tony Northrup said in a YouTube video last October. The upload, which attracted more than 200,000 views, triggered a wage of counterarguments from prominent MFT users like Peter Forsgård, Joseph Ellis and others. Six months later, there's still no consensus. MFT was co-developed by Olympus and Panasonic in 2008. The pair wanted a compact alternative to full-frame DSLRs that still offered excellent image quality and the versatility of interchangeable lenses. The result was a system with a smaller sensor that didn't require a mirror box or pentaprism to operate. That enabled companies to build smaller, lighter camera bodies and a vast library of pocket-size lenses. Before long, MFT was known as the perfect compromise for people who wanted to shoot beautiful images without the bulk and hassle of a full-frame DSLR kit. In the years that followed, a bevy of rival systems popped up, including the Samsung NX line, which used a slightly larger APS-C sensor, and the Nikon 1 series, which sported a smaller CX format. Most of these struggled to gain traction, though a few, such as Sony's NEX and Fujifilm's X Series -- which both use APS-C sensors -- built a loyal following on a similar blend of portability, image quality and nostalgic design. Leica launched a full-frame rangefinder in 2009; however, the onslaught of full-frame mirrorless cameras truly started in 2013 with the Sony A7 and A7R cameras. They were expensive -- at launch the A7R cost $2,300 for the body alone -- but produced excellent images and proved definitively that a larger sensor could be squeezed into a smaller package. Fast-forward roughly six years and Sony's latest models, the A7 III and A7R III, are incredibly popular with photographers, filmmakers and YouTube vloggers alike. The camera industry's lumbering giants, Canon and Nikon, have just caught up and started releasing their own full-frame mirrorless cameras. Even Panasonic, a co-pioneer of the MFT system, has unveiled a Sony rival in the S1 and S1R. Panasonic, Olympus' longtime MFT partner, has just released its first full-frame mirrorless. Compact-camera sales have been obliterated by the increasingly competent photo- and video-shooting capabilities of smartphones. Doomsayers believe that a growing number of people are happy with their phone and will choose a full-frame system for enthusiast and pro-level photography. The hardware can be expensive, they argue, but the price will fall to a point where it's attractive to people who currently have the budget for an MFT system. "You can make a full-frame camera and it doesn't have to be super expensive," Northrup said in his YouTube video. Canon, for instance, has announced a smaller version of its full-frame EOS R camera ($2,299), the EOS RP ($1,299). For now, though, MFT hardware is generally cheaper than full-frame mirrorless cameras. If you have a budget of $2,000, for instance, you can snag a more "complete" kit with a midrange body, some memory cards and a few entry-level lenses. It doesn't always make sense, too, for photographers to continuously sell and upgrade their equipment. "Camera companies are always leapfrogging each other," explained Ellis, a wedding photographer based in Dallas, Texas. "And you need to look at the context of what was available at the time you made the purchase. Just because a new Sony [full-frame] camera has the same things the Olympus has... it doesn't mean that any photographer who's not loaded is just going to jump brands over one model." MFT users also question the desirability of full-frame mirrorless systems. High-resolution images contain more detail and translate well to large, physical formats such as billboard ads. Most photographers, however, rarely require this many pixels. "Most photographers are thinking of the means and then forgetting the end," David Thorpe, a 74-year-old photographer and YouTuber, said. "What is the purpose of having 40 million pixels if your means of reproduction is 2,000 across? What are you going to do with all those pixels? What you're going to do is throw them away." "What is the purpose of having 40 million pixels if your means of reproduction is 2,000 across?" Thorpe has worked for magazines, newspapers and rockstar musicians including Sir Paul McCartney since he was 17. He argues that MFT is "way above the requirements" for most web and print publications. If you're shooting with a bigger sensor, it simply takes longer to export, resize and send the files. "What they want is fewer pixels, better quality," he said. MFT is also fine for wedding photography, according to Ellis. He regularly produces images that are 20 or 30 inches across with his Olympus OM-D E-M1 Mark II ($1,599). "And the only time it becomes an issue is if you have two identical pictures taken with different cameras and you're comparing them side by side in a sniff test," he said. "Anytime you make a larger print, the viewing distance of that print is critical. Nobody appreciates a 20-by-30-inch print from four inches away. You shouldn't. You should be back a couple of feet to take in the whole print. At that distance, the resolution becomes a very, very minor issue." Full-frame mirrorless cameras carry hidden costs too. For one, bigger files require larger and faster memory cards. The stellar Nikon Z7, for instance, doesn't have an SD card slot: It only takes the capable and bank-breaking XQD memory cards. For another, you need a beefier PC and, depending on your preference, larger backup drives and higher-capacity cloud storage. For enthusiast and semi-pro photographers, these workflow and hardware changes add up. "Do you really need it? That's an important question, because if you're just spinning your wheels for all that stuff then that's certainly a big drain on your bank account," Ellis said. Olympus recognizes that smartphones are replacing the entry-class camera. But the company is adamant that MFT is a logical choice for anyone who wants to step up and take their photography more seriously. "If you compare the size of full-frame mirrorless cameras and lenses to mobile phones, it's a huge step," Akihiko Murata, VP of Sales and Marketing at Olympus, said. "So in this place, [Olympus] can play a big role. MFT can play a big role." There's another aspect of the MFT system that photographers love to discuss and, frequently, argue over: equivalence. MFT sensors are roughly half the size of a full-frame camera (if you're measuring the diagonal). That means a 50mm lens on an MFT sensor creates a different field of view than a 50mm lens attached to a full-frame camera. To achieve a similar composition, photographers apply a crop factor of two. In practical terms, this means a 50mm lens on an MFT camera is equivalent to a 100mm lens on a full-frame DSLR. Crop factor also applies to the aperture. It doesn't make a difference to the exposure: If your camera says 1/60 and f2.8 is fine, you don't have to suddenly bump the aperture to f5.6. Your image will be perfectly exposed. However, the depth of field or bokeh effect won't be the same as a full-frame camera that has an equivalent focal length and the same aperture setting. That's because the MFT camera has an equivalent aperture of f5.6, which keeps more of the image in focus. "If you use the same f-stop number and you apply crop factor to the focal length, you will get smaller gear," Northrup said in his YouTube video last year. "But if you apply the crop factor to both the focal length and the aperture, things stay about the same." If you want equivalent image quality, the argument goes, MFT doesn't offer any drastic size advantages over full-frame cameras. "He has a point in the sense that it is with the depth of field, but it's not with the light," Forsgard, a YouTuber and sponsored Olympus Visionary, said. The Finnish photographer believes that exposure is more important than depth of field in a photograph. "Let's say that I have a 25 millimeter, f2.8 lens on an MFT camera," he explained. "And then I have a 50 millimeter f5.6 lens [on a full-frame camera]. That would have the same depth of field, but the exposure would be different." "If I needed more quality than MFT, the next logical step up for me would be a Hasselblad." Most photographers accept that using an MFT system means giving up a small amount of depth of field. "There's a phenomenon going on right now where everybody thinks that [shallow depth of field] is some sort of panacea of photography," Ellis said. "That we all need to be pushing the background so far out of focus and that that makes it somehow professional. But I don't believe that to be true." A wide depth of field, he argued, can add crucial context and narrative to your images. "When you're looking at really great photographs, there are at least two layers of information, foreground and background," he explained. "Oftentimes, there are three or four, and the ability of the photographer to lead your eye through there and have all the pieces in the frame come together is way more powerful than just showing me somewhere where you've knocked the background out to a complete blur." Thorpe is happy with the depth of field trade-off because it allows him to carry lenses that are smaller and lighter than most glass designed for full-frame mirrorless cameras. And should the need arise, he would skip full-frame entirely and shoot with a medium-format sensor. "If I needed more quality than MFT, the next logical step up for me would be a Hasselblad or Nikon," he said. These offer a level of control that simply isn't possible with a small mirrorless camera, Thorpe argued. "You can smash the background completely out of focus or you can bring it in as necessary," he said. "You've got it all there for pictorial effect. People think that full frame does that, but it doesn't. It's a halfway house; it doesn't give you that control." MFT cameras are also hugely popular with filmers. 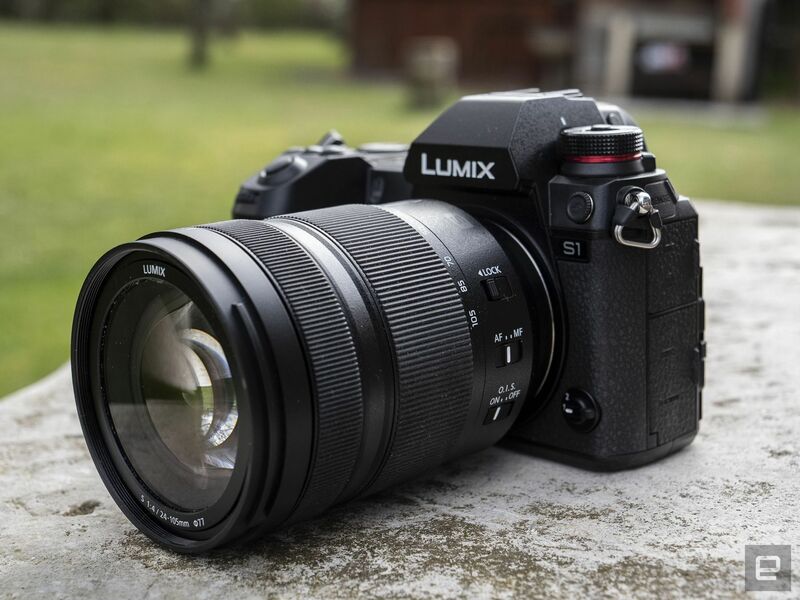 Panasonic's GH5 ($1,498), for instance, is renowned for its small size, stellar battery life and ability to shoot continuous 4K footage at up to 60 frames per second. Two years after its release, YouTube is still flooded with videos explaining why the GH5 should be your primary or secondary camera. "I was just really impressed with the quality of video that I was able to get with the GH5," filmmaker Armando Ferreira said in a recent YouTube video. "Especially now that we're in 2019." Video professionals still have to grapple with the aforementioned bokeh problem. Many don't mind, however, because they're capturing projects or subjects that don't require a shallow depth of field. If you're filming a soccer game, for instance, you normally want everyone in the frame -- foreground and background -- to be sharp. Similarly, a large depth of field can be helpful when you're swiveling the camera or recording fast-moving objects like a sports car or cheetah. There will always be shots, of course, that benefit from some soft and creamy bokeh. It's not compulsory to make a compelling short film or documentary, however. Panasonic's GH5 and GH5s are seen by many as the pinnacle of MFT cameras. MFT users will often talk about qualities that can't be listed on a spec sheet or easily compared with full-frame mirrorless cameras. You can hold it for long periods of time and therefore capture more decisive moments. Unlike a bulky DSLR, it's fairly inconspicuous and shoots silently. And because it has a small footprint, you're more likely to carry it and capture interesting photographs. As the age-old saying goes, the best camera is the one you have with you. And for MFT users, the default doesn't have to be a smartphone. "If you tend to bring the camera more often and have more lenses at your disposal because you're willing to carry them along, then you're at a huge advantage," Ellis explained. There's also the physical design and the way it handles in everyday use. "When people say, 'Should I buy this or this or this?' I ask, 'Which one feels better in your hand?' Start from that." The look of a camera is entirely subjective, of course. And there's no reason why a full-frame mirrorless camera can't resemble and evoke the same emotions as an old film shooter. But for many MFT users, the system has a certain je ne sais quoi that's hard to find elsewhere. "I call Olympus photographers thoughtful rebels because I think that everyone who buys into the Olympus system is going a little bit counterculture," Ellis said. "They're like, 'I'm not going to do what everybody else is doing, I'm going to go over here.' And I think that when you buy an Olympus MFT camera, one of the biggest benefits, and one of the things I see people most excited about, is that it's just a lot of fun to use." That feeling often allows MFT users to forget the spec-sheet wars and endless arguments around equivalence. Instead of focusing on the technology, they worry about the simple art and skill of photography. Landscape photographer Ansel Adams once said, "There is nothing worse than a sharp image of a fuzzy concept." Ellis said, "To me, if you look at some of the most brilliant photographs in history taken on Kodak T-Max P3200 film or old school stuff -- yes, it's grainy; yes, it's not that sharp. But how does it impact us emotionally? How do we take in that content, what does it mean to us? Those things are 1,000 percent more important to me than how sharp, at a pixel level, any one system is." The MFT camera segment has slowed down, but it's certainly not dead. Earlier this year, Olympus announced the OM-D E-M1X, a larger version of its high-end OM-D E-M1 Mark II. It's a specialized camera with a built-in battery grip that's designed for sports and wildlife photography. The company is also working on successors to its entry-level and mid-tier cameras. "We are not just making [the] EM1X," Murata said. "The rest of the lineup will also be renewed. And we will be talking about appealing to [smartphone] users with good size and weight in the future too." MFT users will benefit from new lenses too. "Smaller lenses, better quality," Murata said. "I cannot say more, but I'm pretty sure once those lenses are available, the existing MFT users will be attracted to own those lenses. And this is, at the same time, a very big attraction to users who use the bigger systems right now." Unlike Panasonic, Olympus is staking its entire business on MFT. The company believes there are several different photography markets and that MFT can safely coexist with full-frame mirrorless cameras. The system is particularly strong at wildlife, sports, documentary and underwater photography, according to Murata. "Any photography or situations where you need a portable system with high quality," he said. "That's why I think this is a great system for those kinds of photographers, and this will coexist with full-frame or other, bigger sensors such as medium format." "We still believe this is one of the best solutions." Many photographers, he said, are realizing they can own both systems. "Some people prefer to keep a full- frame [camera], but for the longer trip -- say, a safari trip to Africa -- they prefer a smaller system," he explained. "So actually this is good, both for the industry and photographers, to keep two solutions." Why not develop both MFT and full-frame mirrorless cameras? For Olympus, it's a matter of philosophy. Murata points to Yoshihisa Maitani, the Olympus designer behind the legendary OM (it literally stands for "Olympus Maitani") 35mm SLR system. In some of his old notes, the engineer wrote, "We have to eliminate three evils of SLR: heavy, bulky and shutter shock." Olympus still refers to this document and focuses all of its R&D efforts on producing cameras that are small and lightweight without sacrificing image quality. "Bigger formats, bigger sensors, the things you can use at the studio, this is not in line with our philosophy," Murata said. Olympus also has limited resources. It could develop two systems, but that would mean splitting time and money. Instead, it wants to build the perfect system for people who already own an MFT camera or appreciate its sleek, minimalist approach to photography. "Maybe not for everybody, but for our users that value the small and lightweight," he said. "We still believe this is one of the best solutions for most of the photographers in the market." No one can predict the future sales of MFT systems. And it's impossible to know if any company, including Olympus, will be releasing new bodies and lenses a decade from now. Even if the market collapses, there's nothing that can stop photographers from using the kit they already own and love. In that sense, the system will always have a future. Olympus, though, wants to reassure users that it hasn't given up on the format it helped create. "We want to say to our users, 'Please count on us,'" Murata said.